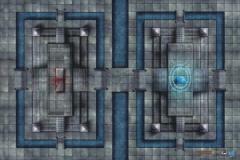 Gale Force Nine’s Official DUNGEONS & DRAGONS Game Mat Sanctuary of Fate are ideal battle grids for staging encounters during your adventures! The vinyl mats may be marked with WET-ERASE markers to temporarily alter terrain areas or make other notes about battlefield conditions during play. The Game Mat measure 20” x 30” and are marked with a 1” grid.